Our monthly time cards are OEM quality approved and made from 150 lb. card stock for overall durability and moisture resistance. We use manila colored time card stock, which provides crisp imprinting from your time clock machine. Rotary cutting manufacturing guarantees proper sizing so that your time clock can operate correctly, with accurate printing. We carry Acroprint, Isgus, and Amano time cards for maximum performance with your time clock equipment. While most one-sided time clock cards are printed with green ink, two-sided time cards are green on the front and red on the back. Some brands also print in black and white. 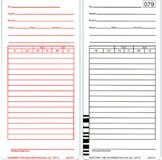 From monthly cross-shift cards to Amano time cards for your time computer, our monthly time cards keep both your employees and your equipment operating efficiently. Don’t settle for inferior monthly time cards. Enjoy free shipping on our time cards today. Find the best time cards on the market at TimeClockeShop.com.